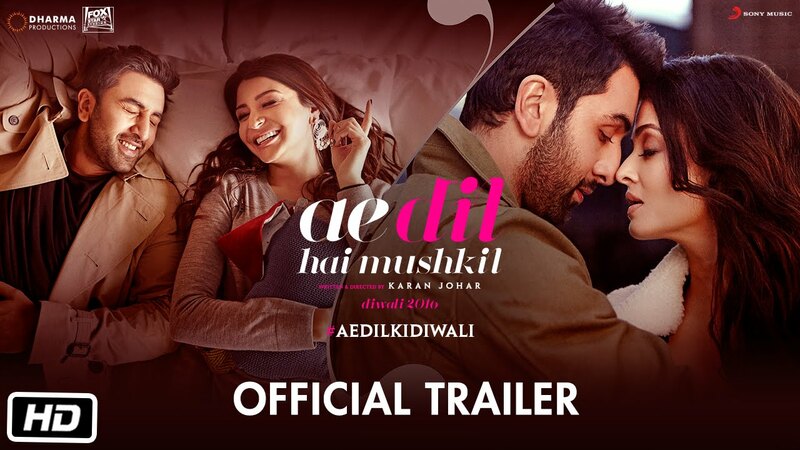 ‘Ae dil hai mushkil’ very literally translates into ‘O heart it is difficult’, though the people with greater understanding of poetry will doubtlessly find deeper meanings into the title. What is important is the fact that it does live up to it’s name. For director Karan Johar does make the situation of Ranbir Kapoor’s heart difficult through a unique take on love and relationships. Ranbir Kapoor plays Ayan, who is a wannabe singer who also dances well. He is befriended by Alizeh (Anushka Sharma) who is modern enough to chill out with a guy who is not her boyfriend. They hang out all over town, laughing and crying and having fun together at discos and restaurants and fulfilling Alizeh’s dreams of dancing on bollywood songs wearing chiffon sarees in snowy mountainous locations. And the inevitable happens-Ayan falls in love with Alizeh. But Alizeh has not gotten over her past relationship and wants Ayan just as a friend. She loves him but is not ‘in’ love with him, with the absence of the ‘in’ being of seminal importance to the situation. This was a situation that I had read in a Shidney Sheldon novel before, but it takes the skills of a Karan Johar to expand it into a full scale movie. And once Alizeh sees her old love again, she at first wants to run away but on being confronted by that person (played by Fawad Khan) she goes back to him. When Alizeh invites Ayan to her wedding Ayan explodes the truth to her-about his love and his longing. And she is left in tears and the ruins of what she dreamt would be a platonic relationship. On the rebound Ayan gets into a intimate relationship with a beautiful divorcee (Saba played by Aishwarya Rai) and this leads to some passionate scenes between the two- but the publicity machine of the film had hyped those into much more than what I got to see. It is enough to be said that there is not much that Aishwarya’s husband Abhishek Bachhan has to complain about. But when Ayan tries to make Alizeh jealous about Aishwarya’s beauty, she is simply happy for him dating such a stunning beauty. And he loses Saba too because she realises whom he really loves. Brought to the crossroads of life by his multiple failures in love and longing, Ayan channels his pain into creativity and becomes what he wanted to become in the start—a famous singer. But what will push him to even greater heights of creativity and singing? A greater tragedy of course, we just have wait for it to happen. What makes the movie watching experience better is the lessons the director teaches us in this journey from pain to success and from tragedy to greater success. If there was ever a university for exploring relationships then I would undoubtedly recommend Karan Johar for position of it’s chancellor. The guy does give new insights every time he makes a movie. The people inhabiting the movie are all good looking- from the beautiful Aishwarya Rai to the good looks of Ranbir to the kohl lined eyes of Anushka. But it is left to Shah Rukh Khan (playing Saba’s ex-husband) to teach Ranbir the ultimate lesson of falling and being in love. Colours and photography are ok without being special. Acting is decent by all. Songs and music is decent too. The movie is less interesting in the first half but becomes better in the second half, with a nice ending. That is where is scores over ‘Shivaay’. ‘Shivaay’ is better in the beginning but meanders in the second half. And people like movies with good endings rather than good beginnings. Ashdoc is a regular reviewer and hence watches all the movies, but YP would boycott this movie just because it features the Pak hugging anti-national crew of film makers and Pakis. Also, the movies from Karan Johar genre are nothing but slimy cesspool of degeneracy, with people jumping around from one partner to another. Although, we can spend time nitpicking the degeneracy, but a review on fb perfectly summarizes it below.